Opening hours 9.30 - 5.30 Monday - Saturday. 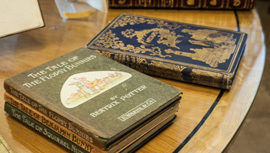 Buying a rare book is something you might do just once, as a very special and unique gift, or you may be a collector, hunting down one particular title. Whatever the motivation, buying something that is scarce or has a note from the author tucked in among the pages, is a special occasion that raises it above the daily shopping experience. Many of our rarer books are listed on ABE. Please ring the shop if there is something you think we can help you with. 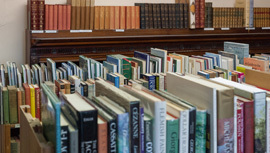 We take as much pride in our new book rooms as in the antiquarian stock. We are all avid readers in the shop and across the staff we probably have something to say about most genres. In addition to stocking new fiction titles we keep our eyes open for the unusual and beautiful and have a good selection of, for example, art, cookery, gardening and craft and design. Our children's book room is well known for its comprehensive range and we love to welcome younger browsers. We stock Ordnance Survey maps, a very wide range of greeting cards, Moleskine Diaries and note books as well as many other book related items. If you are stuck for a gift idea why not consider a book subscription. 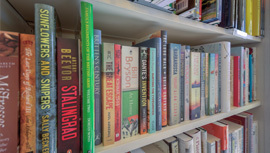 For example, if you have a friend who loves literary fiction, we can select, wrap and send a freshly published paperback novel, each month on your behalf. The twelve monthly paperback option would cost £140. You can also do a bi monthly option or choose a theme such as cookery or art. Contact us to discuss the options and we will quote a price. In his charming essay on bookshops, George Orwell says that second hand books are where bluebottles go to die. Our stock is too well loved for that to happen, often. We have a good range of fiction and non fiction titles and love those eureka moments when we can lay our hands on a long sought after book for a customer. The prices are almost as attractive as the staff.